In this post I catch up with makeup artist, entrepreneur and skincare creator Annabelle Lumba. You may recognise Annabelle from her amazing range of lashes but her creations don’t stop there. She has since gone on to create an incredible range of plant and earth based skincare where only the finest ingredients will do. 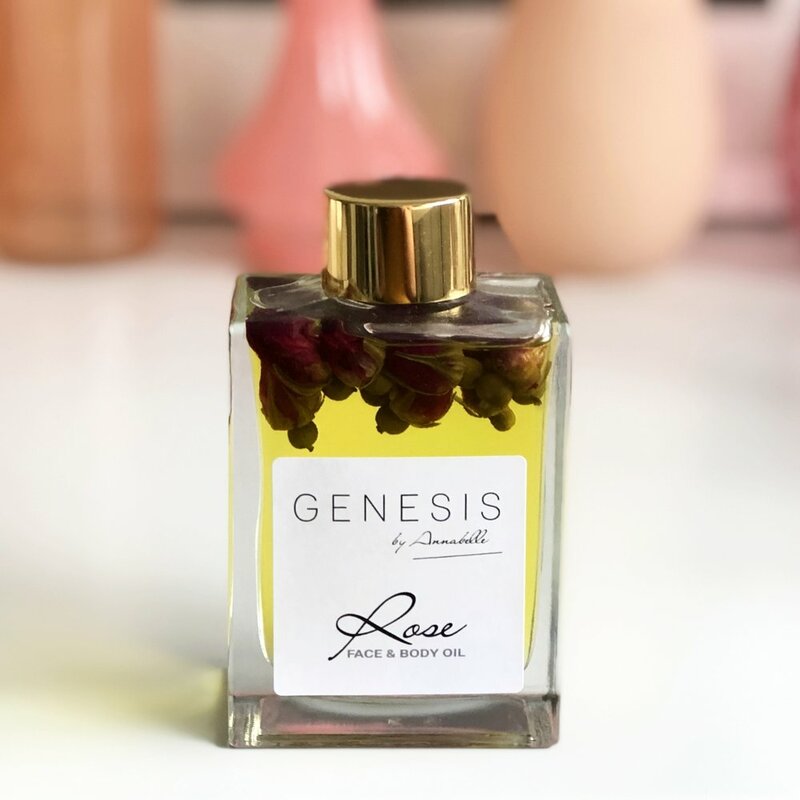 Annabelle has taken time out of her busy day to share more about her latest collection ‘Genesis’ and what we can expect next from this inspirational mogul! 1. Tell me more about your new collection, Genesis? Genesis to me, is the definition of beginning. A new formation. In many aspects, this terminology symbolises a beginning for me in my skincare business, the formation of my dream slowly coming into reality as well as the regime of skincare maintenance. In the beginning of your day, a crucial skin prep is of most importance, and I wanted to create both a face & body oil to nourish, heal and encourage cell renewal so that skin maintains healthy, youthful & glowing throughout the day. My Genesis collection does just that. A formation of new skin to provide healing & restoration. 2. I absolutely love how you have infused your face and body oils with rose buds and amethyst. What was your inspiration behind this? My inspiration for using plants & crystals infused in my skincare was not only for the aesthetic point of view, but also because I know it releases healing properties, and is packed full of vitamins and antioxidants. My aim is to infuse as much skin loving nutrients as I can so our skin can reap the utmost benefits. God's plants and earth do just that! I enjoy creating potent skincare products because I believe a lot of skincare brands do neglect a lot of the earth's gifts, which are so amazingly wonderful for our skin! 3. How involved are you in the formulation and production of your products? I took a course in skincare formulation, from knowing which oils suit which skin type, the appropriate dosages for vitamins, extracts and essential oils. From this I have gained a lot of insight into cosmetic chemistry that I study most nights & I know most formulations and skin types from the back of my hand! Each product, formula, labels, sourcing packaging as well as marketing is all me. I'm a one person at the moment in all this fun and i hope to expand one day in the near future! 4. If you could chose your favourite product from your range what would it be? One favourite product I would choose, is my Blue Tansy Facial Oil. I have just recently launched this and I am in love with it! I trialled and tested it (as well another human lol) for 2 weeks, and have seen a dramatic change in our skin tones. It's definitely a product I have now incorporated into my nightly regimen. 5. What is next for Annabelle Lumba? I'm quite content in how things have progressed with my business and my only hope is to grow bigger, find stockists and hopefully do this full time (I'm a medical secretary by day/sometimes til 7.30pm). Even though I enjoy my job and helping patients, my passion lies in my business! Annabelle has an incredible skincare range as well as beauty tools including a Jade Roller which I personally love, especially when applying facial oils. Start your New Year skincare routine with ethical and quality skincare. If you are unsure of what to get hit Annabelle up on Instagram - she can help you find the perfect product to suit your skin. *These products were sent to me in exchange for a review. The products have been tried, tested and all opinions expressed are honest and my own.